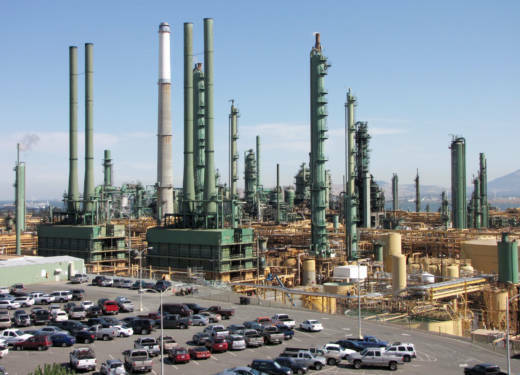 Valero's Benicia refinery, shut down since last month because of equipment malfunctions, could be back online by mid-May, Benicia city officials and state regulators say. Although the company won't provide a date that it plans to restart the Solano County facility, Benicia Fire Chief Josh Chadwick said Monday he estimates the refinery will be back online in the next three to four weeks. "I know we shared information about the status of the refinery on March 24, but beyond that, it is Valero's policy to not comment on operations or possible outages/restarts at its facilities beyond what is publicly reported," said Lillian Riojas, a company spokeswoman. "The Energy Commission can say that the three large refinery maintenance issues are scheduled to be resolved over a period beginning late April through the middle of May," she said in an email. Besides Valero, the facilities involve two in the Los Angeles suburb of Carson: a Phillips 66 refinery that suffered a fire and a Marathon Oil refinery that's been down for planned maintenance. The statewide average cost of a gallon of regular has increased 62 cents since Valero's March 24 shutdown, according to AAA. It now stands at $4.006. "We've had major refinery issues all spring," said AAA Northern California spokesman Michael Blasky. "I've heard it referred to as a perfect storm in the industry, with a lot of refinery incidents of flaring or shutting down for days or weeks at time." In fact, Chevron's Richmond refinery experienced its seventh flaring incident of the year on Saturday, according to Contra Costa County's chief environmental and hazardous materials officer, Randy Sawyer. The incident caught the attention of the Oil Price Information Service. Monday's price marks the first time the statewide average cost for a gallon of regular has topped $4 in close to five years, Blasky said. "I would hope, as refineries come back to their normal levels of production, that we start to see prices level out and hopefully start to come down by mid-May," Blasky said.